This topic covers the new features introduced in December 2016 update for Dynamics 365 (online and on-premises). For the list of upcoming features in Dynamics 365 (online), version 9.0, see our new documentation site on docs.microsoft.com at https://docs.microsoft.com/dynamics365/. As of the December 2016 update for Dynamics 365 (online and on-premises), Dynamics CRM functionality is now included as a part of Dynamics 365, a suite of intelligent business applications. This help content covers the new Dynamics apps for Sales, Customer Service, Field Service, and Project Service Automation. In addition, these pages cover all supported versions of Dynamics CRM. Where relevant, see the Applies to section on each page to determine which versions are covered. For end user features introduced in December 2016 update for Dynamics 365 (online and on-premises), see: Dynamics 365 Help & Training: What's new. If you’re a developer, see: What's new for developers: Microsoft Dynamics 365. See also the Readme file. With this new preview feature for Data Export Service, you can recover from synchronization failures with on-demand resynchronization from the Export Profile toolbar. 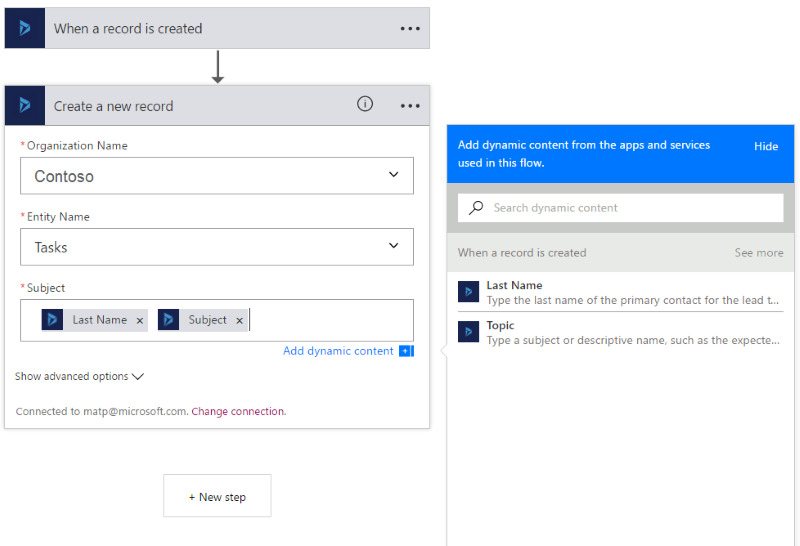 Use Azure Logic Apps or Microsoft Flow to set up automated workflows between a Dynamics 365 (online) instance and your choice from many other apps and services available to synchronize files, get notifications, collect data, and more. Use Microsoft PowerApps to quickly generate, customize, share, and run mobile apps with little or no code. With the Dynamics 365 (online) connector, in just a few minutes you can create useful mobile apps to share with your organization. You can now create custom task-based apps for your users. Apps are solution-aware components that store references to the existing Dynamics 365 schema. Use the new app designer to quickly create simple (single entity) or complex (multi-entity) business apps. The app designer, which is a tile-based information structure, makes the process of designing apps very simple. Just pick the required set of components such as forms, views, dashboards, charts, and process flows, and create simple or complex apps like case management or lead management in no time. Once you’ve pulled together all the components you want, you can also validate your app for any missing or required components. The new site map designer, which is integrated with the app designer, greatly simplifies the process of creating a navigation and site map for your apps. Use the WYSIWYG designer that lets you quickly drag and drop areas and sub areas within the site map. After you design an app, you can control access and visibility to it by restricting it to specific roles. Defining and enforcing consistent processes is very important for any successful business. Dynamics 365 provides a number processes, such as business process flows, mobile task flows, and workflows, to help organizations improve their productivity and customer satisfaction. Up until now, these processes were created and customized by using different design interfaces. In this release, we are making a first step in simplifying the design experience by unifying the customization user interface for business process flows, mobile task flows, and business rules. The new design environment is based on a visual drag-and-drop interface. We are also adding a number of new powerful features and capabilities, such as concurrently running business processes and security role support for business process flows and mobile task flows. The following table lists some of the new features and their benefits. With concurrent business process flows, it's crucial to be able to separate business process definitions according to user roles. For example, a customizer can configure business processes in such a way that the sales people will not have access to the marketing or service team business process flows. Users can work on processes that their security role has access to without interfering with other people’s work. Business process flows trigger events every time a process is applied to a record, its status is changed to Active, Finished, or Abandoned, or the stage is changed. This lets customizers call on-demand workflows to automate the execution of actions based on those events. Customizers can associate business process flows with synchronous (real-time) or asynchronous (background) workflows. The workflows are triggered by changes in the process instance or by changes in the fields of the participating records. The new visual drag-and-drop process designer allows creating processes, such as business process flows and mobile task flows, as well as business rules with Portable Business Logic, through an intuitive graphical interface. Business process flows can be marked as Active, Finished, or Abandoned. This helps track the progress of processes from start to end through charts and reports, as well as enforcing stage gating rules for all stages of the process, including the final stage. Customizers can create new business rules that, based on the data of records, display a suggestion bubble with text that helps guide users while they execute a business process flow or fill out a form. Business process flows now track the time taken on each stage and the total time taken for the process to complete. The reports can be created for the performance to be visualized and analyzed for optimization opportunities. Mobile task flows are generally available for online and internet-facing on-premises deployments. They support Dynamics 365 solutions and security roles that allow customizers to separate task flows based on user role. Certain Dynamics 365 messages can now be called directly from workflows and actions, simplifying the automation of tasks. 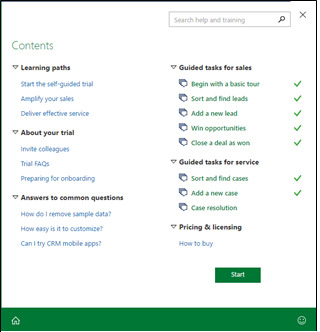 In Microsoft Dynamics CRM Online 2016 Update 1, we introduced Learning Path, which provides contextually-rich training, walkthroughs, videos, and articles right in the app at just the right time. With December 2016 update for Microsoft Dynamics 365 (online), you can now create your own Learning Path experience for your Dynamics 365 (online) users. For example, create a custom Learning Path experience to train your sales team. Learning Path allows you to deliver custom content specific to the security role assigned to a user. This means, for example, that sales people see Learning Path sidebars and guided tasks specific to their role, and service reps see a different set of content. You can also display different content for the same security role in different organizations. You can even localize your content in different languages for different users and organizations. Learning Path provides a great way to help people discover new features and become familiar with new forms or business processes at their own pace right from the app. This can help reduce training time and costs and enable team members to quickly become productive using Dynamics 365 (online). Connected field service: Connected field service, new in this release, helps service organizations move from a costly break-fix model to a proactive and predictive service model by combining monitoring and predictive maintenance with Internet of Things (IoT) and machine learning. More information: Use Connected Field Service to remotely monitor and service customer equipment. Reduce downtime with proactive alerts from connected devices. Address issues faster by remotely monitoring devices and keeping customers in the loop. Reduce maintenance costs by dispatching a technician with the right expertise, availability, and location to do the job. As a platform, IoT also enables ISVs and partners to enable new IoT scenarios on any Dynamics 365 entity. Resource scheduling optimization: With resource scheduling optimization, you can set up the system to automatically schedule multiple items on a recurring basis to minimize overall travel time and make efficient use of all schedulable resources. Resource scheduling optimization takes into account a number of constraints and objectives when optimizing schedules, such as resource availability, skills required, priority and duration, and time windows. More information: Schedule multiple booking requirements on a recurring basis. Common scheduling experience: With the new common scheduling experience, you can schedule anything. You can enable it for any entity, including custom entities. For example, you can turn it on to schedule marketing visits for an opportunity or book time to work on a case, work orders, bookings, and more. For organizations that use Field Service capabilities, you’ll see a new integrated scheduling experience. For organizations that use Microsoft Dynamics 365 Project Service Automation capabilities, you’ll have a new improved scheduling experience. More information: Schedule anything in Dynamics 365. Multi-language portal support: By surfacing the multi-language content you create in Portal capabilities for Microsoft Dynamics 365, you can support your customers, partners, and employees in multiple regions. Multi-language portals also support languages with multi-byte characters, such as Japanese, Chinese, and Korean. Faceted search for knowledge articles: Search portal content by using different characteristics of knowledge articles as filters to improve how quickly customers can find the content they are looking for. Faceted portal searches can increase the visibility and effectiveness of content that may not have been surfaced through a traditional search. Content access levels for knowledge articles: Develop a well-structured knowledge base and provide content to the right audience using content access levels. You can create structured learning paths for your users and prevent content that is not relevant from surfacing. Project Service Automation integration: Vendor companies can use Project Service Automation integration to provide access and visibility for active and closed projects across all stages of a project lifecycle to their partner channel and customer. Partner project service team members, reviewers, and customers can view project status and view quotes, order forms, and bookable resources directly from the partner portal. Field Service integration: Vendor companies can use the Field Service integration to expose information about active agreements, assets, work orders, invoices, and support cases to their partner channel and customers. Partner field service team members, reviewers, and customers can access this information directly from the partner portal. Multi-partner collaboration: Distribute opportunities to multiple partners to maximize a sales opportunity and provide the best solutions for your customers’ needs. Partner sellers can work collaboratively to cover the needs of customers they normally couldn’t with the assistance of other partners and provide information to one another, such as product and pricing updates, notes or comments, and partner contacts to enhance the health of the opportunity. Partner onboarding and recruitment: Use the partner recruitment and onboarding capabilities to identify, recruit, and onboard the best partners in your partner channel for better customer sales and service experiences. Use built-in dashboards to get better visibility of your current partner channel and focus efforts into enhancing your channel coverage based on identified gaps. Partner locator: Enable your customers to find the right partners in your partner ecosystem based on geographic location, product expertise, supported industries, partner categories, and more. Partner portal dashboard: Partners can gain insight into their opportunity pipeline and their performance using portal dashboards. With this information, partners can make more informed decisions about opportunities they bid on, as well as currently active opportunities to more intelligently devote resources and improve the health of their relationships with customers and the parent organization. Deal registration and protection: Enable your partner channel to register more deals by providing deal registration capabilities. Partners can register opportunities through the portal to get deal protection and other benefits. Using these capabilities, encourage your partner channel to partner with you to sell more. New layouts: The new layouts in the mobile app have one important implication for admins and customizers. Items are now displayed in stacks to expose more info at once. Items in each section are stacked together by default, but you can use the form editor to change the way these sections are displayed to better reflect how your organization works. Multimedia content: Users can now record multimedia content directly in the mobile app. Please note that if you’re concerned about large files, you should recommend that users change the settings of their device to take lower resolution photos. Enhanced sync filter: Users can now make more finely tuned choices about what info they want to sync to their devices. That means they don’t have to clog their device’s memory with large sets of records—they can take just what they need. Web Resources Support: Offline mode now also supports web resources. With new facet and filter support, users have the ability to drill into and explore search results without having to repeatedly refine the search terms. The global Relevance Search facets are used for the fields common to most entities in Dynamics 365. Four facets are displayed by default on the left side of the Relevance Search results page, as shown below. They represent Record type, Owner, Modified On, and Created On fields. If a user selects a specific entity in the Record type facet, they can choose up to four additional facets specific to the entity. For example, for the Account entity, you can configure facets that will have information about the account’s annual revenue, the industry they are in, and the primary contact information. The non-text entity fields that you add through View Columns in the entity Quick Find View are shown as entity-specific facets in the Relevance Search results page. Users can now search in documents attached to email and appointments, as well as documents attached to a note. The Option Set and Lookup fields are searchable fields in this release. We also added support for showing results for rows that are shared with a user. The primary and the related entity must be a 1:N (one-to-many) or N:1 (many-to-one) custom relationship. The flag can’t be set on any out-of-the-box system relationships. The primary entity for the relationship must be Account, Contact, or Opportunity. This is because these are the only entity forms in the system where the Activity Associated View appears. You can’t specify any other primary entity for activity rollups. The related entity must support Activities. The new Editable Grid custom control supports inline editing, complex grid logic, and business rules. 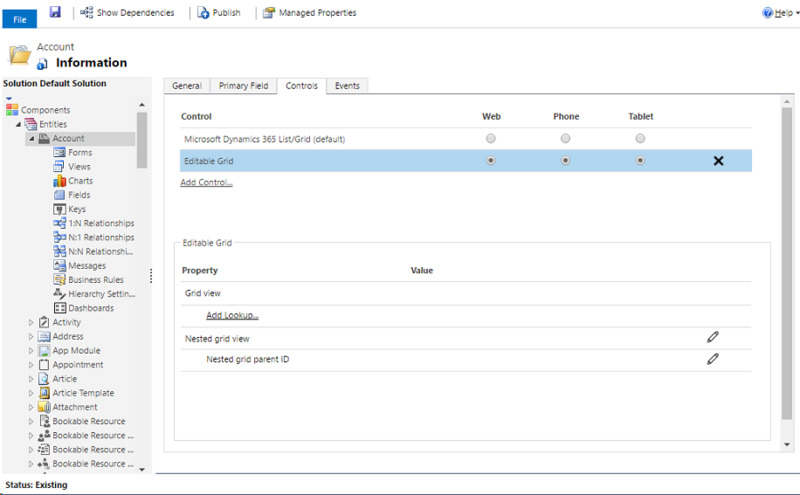 The Editable Grid control can be enabled at an entity level in the Dynamics 365 Web client, Dynamics 365 for phones, and Dynamics 365 for tablets. For dashboards, editable grids are only available in Dynamics 365 for phones and Dynamics 365 for tablets. To enable the Editable Grid control for various clients, go to Settings > Customizations > Customize the System > Components > Entities. In the Information dialog box for an entity, select the Controls tab. Configure the Editable Grid control as a default control for various clients. This will let users toggle between read-only grids and editable grids. Configure Editable Grid control properties, such as Group By filter, Lookup, or related grid properties. This will provide inline editing capabilities in the main grid and the nested grid in one view, without having to switch records or views. Create business rules at an entity level to support business logic in editable grids. Building on the Microsoft Power BI enhancements from the previous release, Power BI dashboards can now be added to Microsoft Dynamics 365 personal dashboards. This release also brings support for Dynamics 365 for tablets and Dynamics 365 for phones mobile clients. Azure Cognitive Services includes several APIs that leverage the power of machine learning. Some Microsoft Dynamics 365 features can use the text analytics APIs to detect sentiment, key phrases, topics, and language from the text found in your Microsoft Dynamics 365 data. Similarly, using the recommendation API, Microsoft Dynamics 365 can automatically make product recommendations to your users. Several features are available that tap into the capabilities of Azure Text Analytics and Recommendations services. Data Export Service is an add-on service made available as a Microsoft Dynamics 365 solution that adds the ability to replicate Microsoft Dynamics 365 (online) data to a Microsoft Azure SQL Database store in a customer-owned Microsoft Azure subscription. The supported target destinations are Microsoft Azure SQL Database and Microsoft Azure SQL Server on Microsoft Azure virtual machines. Data Export Service intelligently synchronizes the entire Dynamics 365 data initially and thereafter synchronizes on a continuous basis as changes occur (delta changes) in the Microsoft Dynamics 365 (online) system. This helps enable several analytics and reporting scenarios on top of Dynamics 365 data with Azure data and analytics services and opens up new possibilities for customers and partners to build custom solutions. Protecting your Dynamics 365 data and providing continuous availability of service is important for you and for us. You have multiple options for backing up and restoring your Dynamics 365 (online) instances. In CRM Online 2016 Update 1, we introduced on-demand backups that you can perform on Production and Sandbox instances. There are two types of Dynamics 365 (online) backups: system and on-demand. All your instances are backed up. System backups are retained for up to three days. Check your expiration date. You can only restore to a Sandbox instance. To restore to a Production instance, first switch to a Sandbox instance. See Switch an instance. On-demand backups are retained for up to three days. Check your expiration date. More information: Backup and restore instances. You can limit access to Dynamics 365 (online) to users with trusted IP addresses to reduce unauthorized access. When trusted IP address restrictions are set in a user’s profile and the user tries to log in from an untrusted IP address, access to Dynamics 365 (online) is blocked. More information: Restrict access to Dynamics 365 (online) with trusted IP rules. 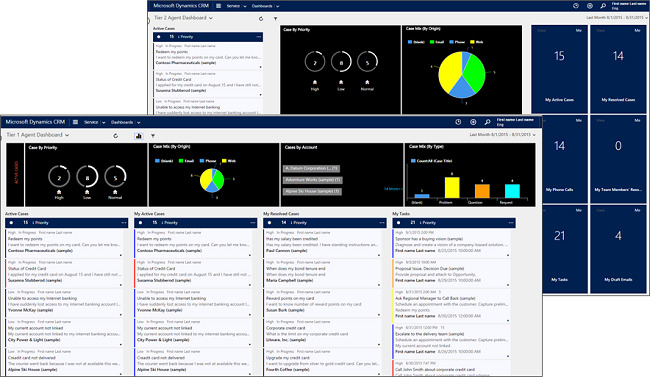 The Organization Insights dashboard surfaces key data points around activity, usage, performance, and quality of service on the Dynamics 365 (online) instance. The new Organization Insights solution adds more insights and metrics such as who are your most active users, which entities are being used, which are the top failing workflows and plugins, and the storage used by your organization's tables. Customer Insights is a cloud-based SaaS service that enables organizations of all sizes to bring together data from multiple sources and generate knowledge and insights to build a holistic 360° view of their customers. Customer Insights delivers the ability to connect to transactional data sources and model profiles of customers and their interactions. It enables organizations to generate insights through key performance indicators (KPIs) about their business. The Customer Insights application transforms the profile, interaction, and KPI’s into rich visuals that you can customize and organize to focus on what matters to you. 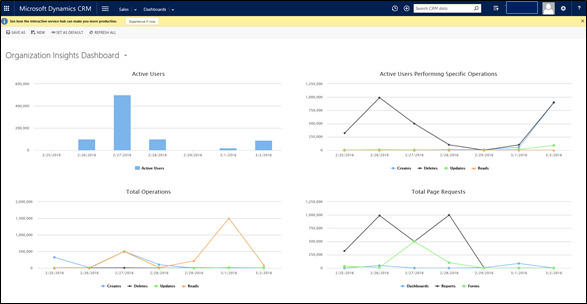 Customer Insights is offered as a preview feature for December 2016 update for Microsoft Dynamics 365 (online). A preview feature is a feature that is not complete, but is made available before it’s officially released so customers can get early access and provide feedback. Preview features aren’t meant for production use and may have limited or restricted functionality. Preview features must be enabled by an administrator. Many sales professionals spend a large part of their day working in Dynamics 365, Microsoft Outlook, and Microsoft Exchange. And the more you use them, the more these systems become filled with invaluable details about your plans, activities, meetings, communications, sales successes, and more. 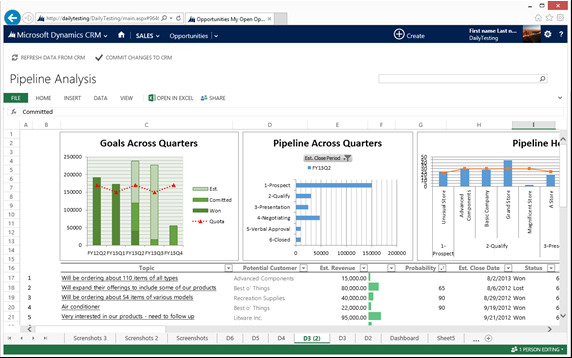 The new Relationship Insights suite of features in Dynamics 365 continuously analyzes this vast collection of customer-interaction data to help you better understand your business relationships, evaluate your activities in relation to previous successes, and choose the best path forward. All Relationship Insights features are offered as preview features for December 2016 update for Microsoft Dynamics 365 (online). A preview feature is a feature that is not complete, but is made available before it’s officially released so customers can get early access and provide feedback. Preview features aren’t meant for production use and may have limited or restricted functionality. Preview features must be enabled by an administrator. You can enable or disable each Relationship Insights feature individually on the Previews tab in the System Settings dialog box. 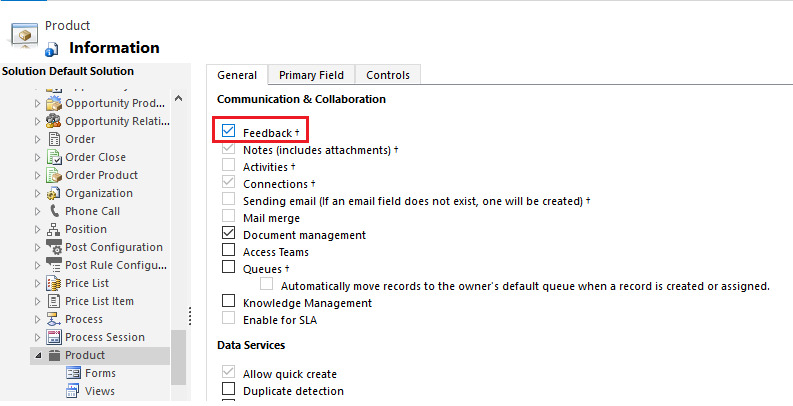 Configuration settings for the Relationship Insights features are provided on a new tabbed settings page. To find it, go to Settings > System > Relationship Insights. From here you can enable, disable, and configure the various sub-features. The settings you make here apply to all users. In this release, we’re introducing Learning Path, a new guided user experience that provides context-sensitive, interactive, and scenario-based guided tasks and sidebars personalized to the user, their lifecycle stage, and role. Whether the user is participating in a trial, has just purchased, or has recently updated their service, Learning Path helps them onboard quickly, facilitates adoption, and improves productivity. In this release, we’re providing Learning Path guidance for onboarding, what’s new, and frequent tasks such as lead management in the web and mobile apps. This release introduces the first Microsoft-published version of portal capabilities for Dynamics CRM 2016. Portal capabilities for CRM empower the 84% majority who prefer to find answers on their own through self-service and community options. Portal capabilities are provided as an add-on for customers who upgrade to the latest version (CRM Online 2016 Update 1). 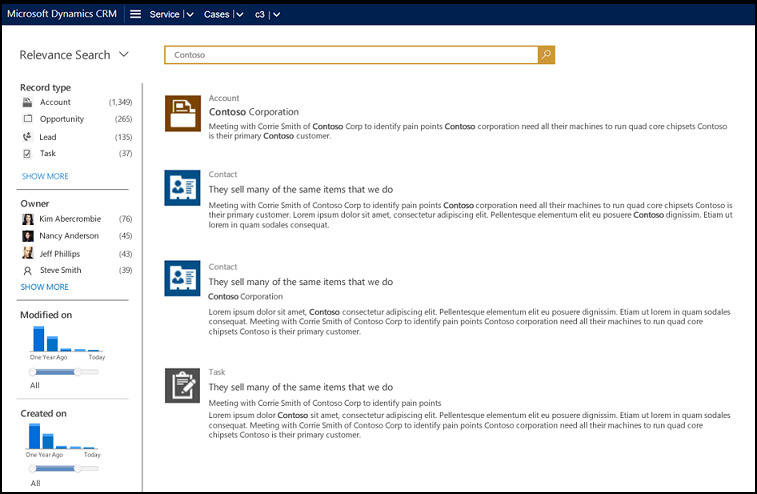 Customers can purchase portal instances as an add-on in the CRM Online Administration Center. These portal instances can then be configured to work with their CRM Online instances. The provisioning system automatically deploys the portal solution to Azure. Employee Self-Service portal. Creates an efficient and well-informed workforce by streamlining common tasks and empowering every employee with a definitive source of knowledge. Employee self-service is now available worldwide using CRM Online and portal capabilities, and is available in all CRM Onlinemarkets. Partner portal. Create an environment for interacting with your partners and collaborating on sales opportunities to provide products and services based on your customers' needs. You can enable feedback on entities to allow customers to write feedback for any entity record, or rate the entity records within a range of allowed ratings. For example, enable feedback or ratings on the Case entity to receive feedback on the customer’s support experience. When several customers rate a record, the ratings can be consolidated through a custom rollup field. By default, feedback is enabled for the Knowledge Article entity and the rollup field is added to Knowledge Article entity. Project service automation capabilities are provided as an add-on for customers who upgrade to the latest version (CRM Online 2016 Update 1). Project-based contracts. Project contracts relate quotes and orders to project plans, financial estimates, labor pricing, and billing arrangements, like time and materials or fixed price. The contract highlights key metrics, including profitability and feasibility. Project planning. Visual project planning and estimation includes predecessors, automatic task scheduling, and views of sales and cost information for time and expenses. You can use the resulting plan in quotes and project contracts. Resource management. Resource information includes the skills and proficiencies of your workforce. You can view and filter resources based on skills and availability, so you can assign the right people to the right projects. You can also track resource utilization and forecasting metrics. Time and expenses. Team members can use the web or mobile apps to record time and expenses for multiple projects. Managers can easily approve new entries while understanding the financial implications of the newly-approved items. Project billing. Project invoices reflect the terms of the contract and the approved work and expenses. The financial impact of project work, including costs, unbilled revenue, and invoices, is recorded for use in analytics and integration into financial systems. Both project service automation capabilities and field service capabilities (see below) share a resource pool, with resource schedules appearing in both. Field service capabilities are provided as an add-on for customers who upgrade to the latest version (CRM Online 2016 Update 1). Characteristics and proficiency ratings. You can define proficiency and competency levels and set them as requirements for a work order. Proficiency and competency levels are also part of the worker profile, so you can make an appropriate match when scheduling resources. Detached schedule support. Field service capabilities support time allocation outside of a work order. For example, a field tech can schedule time for lunch or supply provisioning without having to associate that time with an empty work order. Out-of-the-box business processes. The CRM Online incident management business process is closely aligned with the work order process. If a field service work order originates from a case, the originating case is visually part of that workflow, which spans from case creation through work order completion. Mobile enhancements. Drip scheduling enhances and de-clutters the user experience by displaying fewer upcoming work orders. It also improves dispatch control by limiting the number of declined work orders or change requests by field techs. Both field service capabilities and project service capabilities (see above) share a resource pool, with resource schedules appearing in both. Enhanced Microsoft Power BI integration lets you discover, analyze, and share data-sourced visualizations with colleagues. Power BI provides information workers and everyday business users with data analysis and visualization capabilities to get better business insights. New Service Content Pack includes several key service indicators such as cases created, cases resolved, satisfaction percentage, top agent leaders, and most used and viewed KB articles. The ability to embed Power BI tiles directly from a CRM user dashboard without having to switch to the Power BI service. Imagine being able to make product recommendations to your customers when they select an item for purchase. When you connect CRM Online to the Azure Recommendations API using Azure Machine Learning, this becomes available to you. You can use the Recommendations API to build an advanced machine learning model for automatic cross-sell product recommendations based on historical transaction data. Once you add the product recommendations capability in CRM Online by using the Recommendations API, a native capability is added to the product catalog to generate automatic recommendations by configuring connectivity to the service. In addition, you set up the product catalog and synchronization to build a machine-learning-based recommendation model. You will then use this model to make recommendations in CRM Onlinetransactions, such as opportunity, quote, or order level, to suggest additional cross-sell products and help improve the total value of the deal. Product recommendations is offered as a preview feature for CRM Online customers only. A preview feature is a feature that is not complete, but is made available before it’s officially released so customers can get early access and provide feedback. Preview features aren’t meant for production use and may have limited or restricted functionality. Preview features must be enabled by a CRM administrator. You want your customer service reps to quickly resolve cases with high customer satisfaction. Using the Azure Machine Learning Text Analytics service with CRM Online, you can set up service case analysis to automatically provide your support staff with more relevant solutions from the knowledge base. They spend less time searching for answers and more time providing the right response. Knowledge base suggestions is offered as a preview feature for CRM Online customers only. A preview feature is a feature that is not complete, but is made available before it’s officially released so customers can get early access and provide feedback. Preview features aren’t meant for production use and may have limited or restricted functionality. Preview features must be enabled by a CRM administrator. The interactive service hub can now be integrated with Unified Service Desk so users can open and control interactive service hub pages inside Unified Service Desk. We also made metadata sync improvements to reduce download times for users. For more information on enhancements to the interactive service hub for customer service reps, see What's new for end users. Windows Update. Unified Service Desk also supports Windows Update now. Windows Update is an easy and free way to help keep Microsoft applications (like the Unified Service Desk client) safer and running smoothly. Just turn it on, and you'll get the latest security and other important updates from Microsoft automatically, or you can choose to apply updates manually. Demo packages. New demo packages include samples for new Unified Service Desk environments, upgrading existing Unified Service Desk environments, interactive service hub integration, and CRM 2013 or later web client. Mobile offline synchronization, an enhanced offline experience that goes further than the offline drafts experience, is now available for CRM Online customers. The new mobile offline capabilities provide a richer offline experience for end users, allowing them to view, update, and add records while using the mobile apps offline—without having to save changes or additions as drafts first. The new mobile offline experience also supports conflict detection. CRM mobile applications for iOS and Android can now be managed by Intune Mobile Application Management (MAM) without enrolling the device. This protects company data in Dynamics CRM without requiring IT to enroll and deeply manage the user's entire device. This is particularly useful for bring-your-own-device (BYOD) scenarios where end users don’t want to or can’t enroll their devices for IT management. This capability is also useful if a device is already enrolled in another MDM solution. Use Azure with CRM Online to set up conditional access from mobile devices. You configure conditions for CRM access at the AzureActive Directory group level. For example, you might want to set up conditions that require multi-factor authentication for mobile users accessing CRM when they’re not at work—or maybe you want to require it at all times. You can also set up conditions that require the user’s mobile device to be compliant with your policies before the user can access CRM. If the device isn’t enrolled with Intune, or isn’t registered in AzureActive Directory, a message provides instructions about how to install the company portal app, enroll the device, and (for Android and iOS devices), activate email, which associates the device’s Exchange ActiveSync ID with the device record in AzureActive Directory. If the device isn’t compliant, a message directs the user to the Intune web portal where they can find information about the problem and how to remediate it. To use conditional access, you must have an AzureActive Directory premium subscription. We made metadata generation improvements to reduce configuration times for mobile users after you customize your CRM system. The metadata package that's generated after you make customizations contains only the items that have changed. Instead of starting over if there's a problem downloading the metadata package, the download starts from where it left off the next time a user starts the app. The Company news and timeline solution lets users see the latest and most important news from Bing news on their mobile devices. News articles are organized by time (Today, This Week, Last Week) and contain the headline, date/time, and source of the news article. Important events are detected and categorized, including management changes, earnings releases, new offerings, cost cutting, growth, legal issues, acquisitions, and partnerships. You can use a new custom control to add and configure a news feed for the mobile apps. Use the new Organization Insights Dashboard to get a quick overview of key areas (such as activity and usage) for your CRM Online instance. See views like the number of active users and form load times. The Organization Insights Dashboard is offered as a preview feature for CRM Online customers only. A preview feature is a feature that is not complete, but is made available before it's officially released so customers can get early access and provide feedback. Preview features aren't meant for production use, and may have limited or restricted functionality. Preview features must be enabled by a CRM administrator. You can use server-side synchronization to automatically synchronize email, tasks, appointments, and contacts between CRM Online and Microsoft Exchange. Server-side synchronization is required for CRM App for Outlook (lightweight app) or for Exchange folder tracking. It’s not required for CRM for Outlook (full app), but you can use it as the synchronization method for Dynamics 365 for Outlook. We introducedCRM App for Outlook in CRM Online 2016 Update. You can use this lightweight app to track email from within Outlook. In Dynamics 365 App for Outlook, CRM data appears right in your Outlook Inbox. Now you can use Dynamics 365 App for Outlook with CRM on-premises. You can use Dynamics 365 App for Outlook with the following capabilities on the following clients. Dynamics 365 App for Outlook requires Exchange Server 2013, 2013 SP1, or 2016. Previous versions of ExchangeServer don’t support the add-in platform that Dynamics 365 App for Outlook requires. 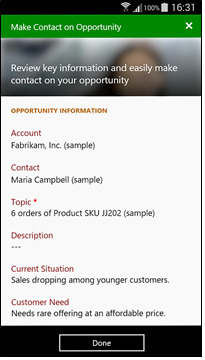 Previously, several out-of-the-box entities in Dynamics CRM, such as the Case, Lead, and Opportunity, entities contained a field that represented a customer (account or contact). With this release, you'll be able to add the Customer field to any system or custom entity to track the customer information you need. We're opening a new datacenter in India. Once available, you can open new tenants or migrate existing tenants to this datacenter. The Package Deployer tool has been expanded to run from a command prompt and it accepts a parameter that allows for more control over solution package deployment, including language selection and the option to preserve data. The WindowsPowerShell cmdlets for the Package Deployer include the same enhanced functionality. Relevance Search delivers fast and comprehensive search results in a single list, sorted by relevance. To boost performance, Relevance Search uses a dedicated search service external to Dynamics CRM, powered by Microsoft Azure. As an administrator or customizer, you can enable and configure Relevance Search in the user interface without writing code. Many of the configuration steps will look familiar to you, since the user interface is similar to the Quick Find configuration. Relevance Search is offered as a preview feature for CRM Online customers only. A preview feature is a feature that is not complete, but is made available before it's officially released so customers can get early access and provide feedback. Preview features aren't meant for production use, and may have limited or restricted functionality. Preview features must be enabled by a CRM administrator. Once you publish customizations, the first user to start one of the CRM mobile apps or the interactive service hub can experience performance issues, because their sign in prompts CRM to prepare the metadata package for download. That means the first user has to wait for both the metadata package preparation and the download (subsequent users only have to wait for the download). With CRM 2016 Update 0.1 or later, you can improve performance for that first user by clicking the Prepare Client Customizations button after publishing your customizations. This prompts CRM to prepare the metadata package right then instead of waiting for the first user to start a mobile app or the interactive service hub. Now your users can use the right storage option for the right situation. For example, store private documents using the new OneDrive for Business option. For collaborative storage, use Office 365 Groups, and for documents you want to share with a larger group or company-wide, use SharePoint. OneDrive for Business is currently available in SharePoint Online and coming to SharePoint on-premises with SharePoint 2016. If your team frequently creates the same Excel documents over and over in CRM, use Excel templates to speed up document creation. For example, use a pre-formatted template to monitor sales and project cash flow (pipeline analysis) or forecast sales. After creating and uploading a template, share it with the team. Standard documents are a cornerstone of business dealings – from quotes and contracts to work orders and invoices. With this release, your users can create documents from standardized templates, and pull in CRM data at the same time. Use templates to enhance productivity, reduce human error, and ensure consistent communication across the company. 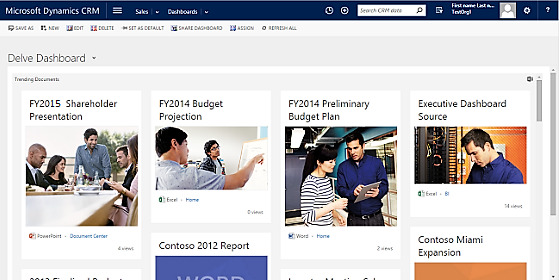 Office Delve proactively surfaces trending documents relevant to you and your work. Discover new content and make new connections right from a dashboard. Now it’s easier to configure Dynamics 365 for phones and tablets once and deploy everywhere. See how your changes will look on tablets and phones in the new mobile form and dashboard previewer. Use new visual controls in Dynamics 365 for phones and tablets to help mobile users enter Dynamics 365 data faster, and to provide a richer visual experience. This set of custom controls includes sliders, switches, star ratings, video embedding, and a calendar control that you can use to give users a view of their activities in a calendar format instead of a list. Use the CRM mobile apps in conjunction with Microsoft Intune. Intune provides mobile management capabilities that allow you to encrypt, remotely wipe, and apply policies to your CRM mobile apps to comply with your company’s security policies. Encrypt data with Intune on Apple, Android, and Windows devices. 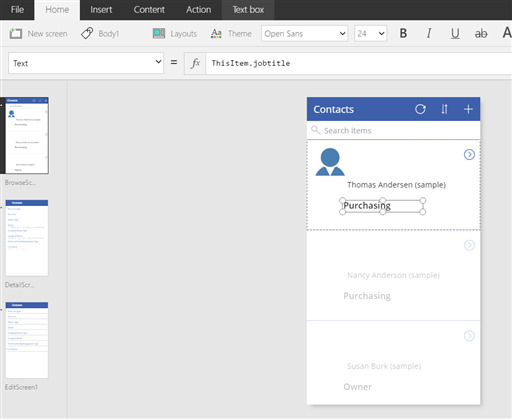 You can now use iFrames and web resources in forms for mobile apps, just like you can in the CRM web app. For Windows devices, you must be using Windows 10. New task-based experiences are immersive experiences that allow users to focus on the tasks they need to do, not the records they need to interact with. With task-based experiences, you can bring data from multiple entities into a single user experience. For example, if users need to do a series of follow-up steps after client meetings, create a task flow. Mobile task flows are offered as a preview feature for CRM Online. Preview features are subject to specific limitations. Learn more about preview features. Interactive service hub dashboards provide workload information across single and multiple streams and enable service personnel to take action directly from a dashboard. You can choose from four layouts to customize these dashboards. For example, customize streams, charts, filters, and sortable filters. Or create all-new dashboards. This release also introduces two new types of forms for the interactive service hub: Card and Main InteractionCentric. You can customize these forms or create new interactive-centric forms for any new custom entity that’s enabled for the interactive design. Quick create and quick view forms are shared between the web client and the interactive service hub. You can also customize the Reference Panel (related items) on interactive service hub forms by adding vertical tabs. Upgrades aren’t supported for version 1 of the interactive service hub. When you upgrade to Dynamics CRM 2016, your service hub forms (for valid service hub entities) won’t automatically be upgraded to include all customizations that you make to web client forms for the same entity. For example, if you have customized the main case form in the web client, the service hub case main form will be the system-defined form—it will not include any customizations. You’ll need to make those customizations manually (provided those customizations are supported in version 1). If you currently use CRM Online and Exchange on-premises, and you synchronize email, appointments, contacts, and tasks with Dynamics CRM for Outlook, or if you synchronize email with the Email Router, you can now synchronize email, appointments, contacts, and tasks by using server-side synchronization. If your organization uses server-side synchronization for email processing, you can use the improved Server-Side Synchronization Performance dashboard to monitor the health of mailboxes in your organization, and quickly troubleshoot problems. Use the new Data Loader service (accessed from a link in the CRM Online Admin Center) to import bulk data into CRM Online. Upload large data files to cloud staging tables where you can perform light data quality functions, and then push the data to CRM Online. This service also supports recurring data imports. The Data Loader service is offered as a preview feature for CRM Online. Preview features are subject to specific limitations. Learn more about preview features. With solution segmentation, you can export solutions with selected entity components, such as attributes, forms, or views, rather than entire entities with all the components. This will provide a tighter control over what you distribute in solutions and solution patches. You don’t have to write any code to create segmented solutions. With the new navigation bar design, you can find information easier and faster, even if you have to navigate through a large number of entities. We also provided access to most recently viewed records (up to 30 records) and quick navigation in large forms with many fields. The Use legacy form rendering setting is expected to be removed in an upcoming release of Dynamics CRM. Therefore, we recommend that you update your customizations as soon as possible and set Use legacy rendering to No to take advantage of the form rendering enhancements. You can enable folder-level tracking for Microsoft Exchange folders to map an Exchange folder to a CRM record. Any email moved to that folder will automatically be linked to the mapped record in CRM. For example, let’s say you have an account called “Adventure Works” in Dynamics 365. You can create a folder in Microsoft Outlook called “Adventure Works” in your Inbox folder, and then create Exchange rules to automatically route email messages to that folder based on the subject or body of an email message. Next, in CRM map the Adventure Works folder to the account record (Adventure Works). Earlier versions of Microsoft Dynamics CRM were limited to the Older Than X Months clause for filtering, by using Older Than. You can now filter on additional units of time including minutes, hours, days, weeks, and years. The Older Than X clauses can be used with Advanced Find, the saved view editor, and queries that are based on FetchXML. You can create a custom look and feel (theme) for your application by changing the default colors and visual elements provided in the uncustomized CRM system. For example, without writing any code, you can create your personal product branding, add a company logo, and provide entity-specific coloring. The theme colors are applied globally throughout the application, with the exception of some legacy areas, such as gradient buttons. You can define multiple themes, but only one can be set and published as the default theme. Custom themes are also supported by Microsoft Dynamics CRM for Outlook. Changes made to an organization's theme aren’t included in solutions exported from the organization. To learn how to export\import a custom theme, see: Manage configuration data. You can now compute the difference between two dates by using new built-in functions available for calculated fields: DIFFINDAYS, DIFFINHOURS, DIFFINMINUTES, DIFFINMONTHS, DIFFINWEEKS, DIFFINYEARS. Enhancements to business rules let you clear field values on both the client and server to ensure accuracy of your CRM records. No code required. Workflows and dialogs support many business scenarios. In previous releases, you could call basic SDK actions, such as create, update, and delete a record, from a workflow or a dialog. In this release, we coupled workflow and dialog capabilities with the power of custom actions, so now you can invoke a custom action directly from a workflow or a dialog without writing any code. Microsoft Dynamics 365 for Good is a special version of Dynamics 365 for tablets that works with Good Technology’s mobile security platform. Microsoft Dynamics 365 for Good is currently supported for Apple iPad running iOS 7 or later. To use Microsoft Dynamics 365 for Good, you must have Good Dynamics server software and services from Good Technology. The app is listed in the Good Dynamics Marketplace and can be downloaded from the Apple App store.